(251) 653-9333 & (251) 928-1028 are the numbers for the true Master of Disaster, ServiceMaster Advanced Cleaning & Restoration in Mobile and Baldwin Counties in South Alabama. We have heard stories of unscrupulous characters overcharging and filing suit against homeowners to collect on outrageous charges that insurance companies refuse to pay. It simply isn't the chance dealing with people who aren't from our area, haven't been here, don't have a history here and haven't been operating here for many years. At ServiceMaster Advanced, we work with all insurance companies and in the case of no coverage, we will likely be less expensive than any other legitimate provider. Don't sign a contract with anyone until you talk with us. Please check our links to learn more:http://www.servicemastermobilealabama.com/ServiceMaster-ADVANCED-Franchise-7027-Mobile-_1.html Make sure you tell your insurance carrier when you call in your claim that you want ServiceMaster ADVANCED, enterprise number 7027, to handle your claim. You will be glad you did. 2. A local mitigation company utilized a dessicant dehimidifier without using air movers (apparently he didn't know proper drying techniques), and let it run for 12 days! The small commercial job could have been done in 4 days tops. He rented the equipment and was determined to recover his dailey rental costs, and over-billed the custoemr by approximately $20,000. Also, beware of middle men who have only a web presence here in Mobile or operate out of a one room suite with a telephone. These people have no loyalty to your community, and often subcontract work out to untrained subcontractors who may or may not do simple background checks on their personnel. These subs likely aren't trained, or certainly aren't trained to degree that the long tenured employees of ServiceMaster ADVANCED are. ServiceMaster has been here. All along. We have handled some of the largest water damage and fires damage cleanup jobs ever handled in the area and we have performed services for literally thousands of satisfied customers. Please check our page which tells a lot about the customers we have served over the past 25 plus years in both videos and articles. 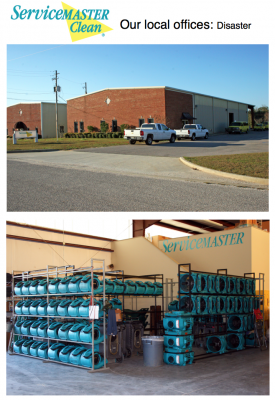 We live and work here in Mobile and Baldwin County, Alabama. We go to church here. We go to school here. We volunteer here. We pay taxes here. We are part of YOUR community. We are your neighbors and we have been and continue to be, here for the long term. 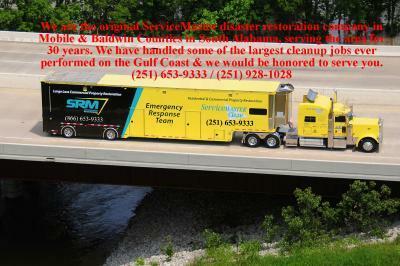 ServiceMaster ADVANCED, The Master of Disaster, (251) 653-9333 Mobile County / (251) 928-1028 Baldwin County. Make certain that you are calling, or tell your insurance company to ask for Enterprise number 7027. "We would be honored to serve you."